St Patrick left his mark throughout the country and how his feast day is celebrated has changed throughout the centuries. St Patrick’s Day only became an official public holiday in Ireland in 1903. Additionally, until 1970, no alcohol could be sold on the day. Although that did not prevent locals from partaking in a few drinks. 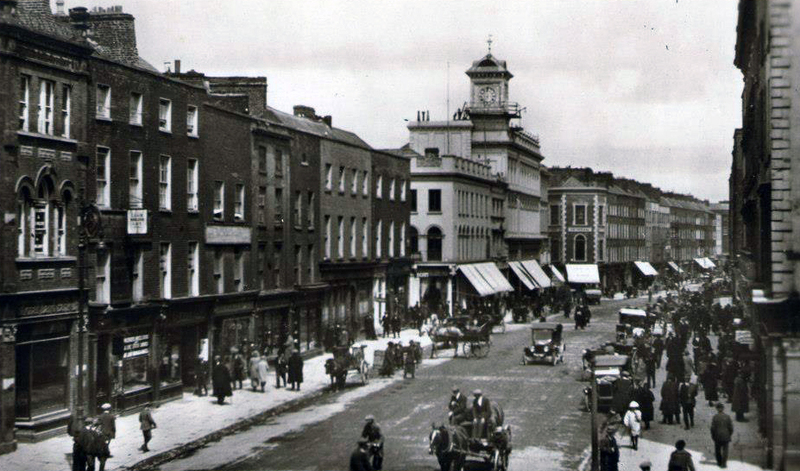 In 1883, the Irish Examiner reported that there were only a few cases of drunkenness reported in the city a decrease on previous years while the numbers in the county had increased. The first report of a St Patrick’s Day Parade did not take place in Ireland until 1931, while the first parade in the world took place in 1737 in Boston. Ireland is not the only country to have St Patrick’s Day as a national holiday. For instance, the island of Montserrat in the Caribbean, which once had a large Irish population, also celebrates the day. St Patrick’s Day – To-day being St Patrick’s Day there was more than usual bustle in the city. A very large number of country folk poured into town, and by all classes, the shamrock was prominently displayed. The weather during the earlier part of the day was beautiful, a warm sunshine prevailing at times, but during the afternoon rain fell heavily and the evening continued inclement. St Patrick had a major influence on Limerick. In 434, the saint visited the city at Saingeal (Singland) where after labouring on a church in Donoughmore he laid on a flat stone and slept. This stone was locally as leaba Paidraig or Patrick’s bed. During his stay, he is believed to have baptised a Dalcassian king called Cairthenn the Fair and his son. Two of the descendants of Cairthenn the Fair would be remembered in Limerick as saints. Liadhain, also known as Lelia, the great granddaughter of the prince became St Lelia and gave her name to Killeely (Cill Liadaini). The historic Black Book of Limerick, which dates in part from the fourteenth century, records that a church bearing her name was standing here in the 1200s though it has long since disappeared. Her feast day is celebrated on 11 August each year. St Lelia’s brother is said to have been Mainchín Mac Setnai also known as St Munchin the supposed first Bishop of Limerick. According to legend, St Munchin had an interesting relationship with the city, having cursed the native population of the city, stating that only foreigners will flourish in the city. His reasoning for the curse was while he was building his church it was only foreigners to the city that stopped to help him. Despite this, he was named patron saint to the city and has not one but two churches in the city named after him. There were a number of sites in the city named after St Patrick including Singland and a holy well in St Patrick’s Parish. Singland was named after a second angel, which visited St Patrick at this particular location. A church and round tower was erected on the site in Singland, although it was still visible though in ruins in the Down Survey Map of 1683 and later fully demolished in 1776. The only remanence of this church is a bell, which is in the Hunt Museum collection and a stone carving of St Patrick holding a double armed cross in St Patrick’s Boys School on the Dublin Road. Today this is the site of St Patrick’s Graveyard next to St Brigid’s Church on St Patrick’s Road.